Online food delivery system is taking up the pace and is shifting towards ordering through online platforms, induced by the increasing internet penetration and well equipped delivery services. Over the years Pizza has been the major food type, but even after the evolution of online portals and smartphones, pizza acquires 60% of the total food ordered. The evolution of food ordering app has boosted the global food ordering market. In U.S., 50% of the people ordering food for delivery enjoy using food delivery apps. The convenience of ordering food by comparing the menu of various restaurants and quick delivery of meals straight at home/offices has attracted the people towards using food app services. These developments have grown the food delivery business opportunities that acquired 43.0% market share of the total restaurant industry in 2017. Goldstein Research analyst forecast that the global online food delivery market size is set to reach USD 25 billion by 2025, growing at a CAGR of 3.7% over the forecast period. The factors such as improved logistics, increasing penetration of internet and smartphones and development of user-friendly food apps are majorly impacting the growth of global online food delivery market. The report covers the present ground scenario and the future growth prospects of the online food delivery market for 2017-2025 along with the global sales of food delivered and global revenue of online food delivery market. We calculated the market size and revenue share on the basis of revenue generated from major players across the globe. We have forecast the market on the basis of food delivery service providers and number of completed orders placed online for deliveries. On the basis of business model, logistic based food delivery system accounted for larger market share of 48.6% in 2017. Logistic based food ordering system has proven results of higher EBITDA as compared other type of business models. This has been even beneficial to restaurants which do not have their own established delivery system. Full service food ordering system is a flourishing business model type, which is beneficial for small scale and independent restaurants that have their own kitchen and logistics. Over the forecast period full service food ordering system is expected to grow at a CAGR of 3.9%. Online food delivery market outlook 2017-2025, has been prepared based on an in-depth market analysis from industry experts. The report covers the competitive landscape and current position of major players in the online food delivery market. The report also includes porter’s five force model, SWOT analysis, company profiling, business strategies of market players and their business models. Global online food delivery market report also recognizes value chain analysis to understand the cost differentiation to provide competitive advantage to the existing and new entry players. As the development never stops and so the rapid changing food industry, it is steering the growth of global online food delivery market. From the evolution of delivering food through phone call orders, it has developed to dependence upon food apps and in the near future trend of drones are expected to take over the logistic segment for faster food delivery. The advancement of technology has widened the scope of food delivery services with the support of software solutions. 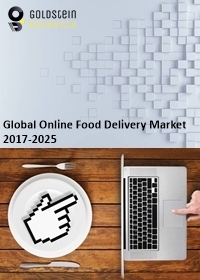 The rising millennial population, increasing penetration of internet and smartphones and the increased space for restaurants and food outlets to grow their customer base through online portals is driving the expansion of global online food delivery market. However, the food delivery system face hurdles with the commission and other charges. The minimum charges per order received by the service provider are less than the actual cost incurred. There is a scenario of cash burn, such as if the cost incurred is USD 7 per order and the commission amounts to USD 5 per order, there is a loss of revenue and the flaw in the system needs to be corrected as per the scenario. Based on geography, North America accounted for largest market share of 53.4% in 2017 of the global online food delivery market. North America consists of major global players and also the large customer base ordering the food through online platforms. Further, Asia-Pacific region accounts for maximum millennial population, who are handy with online platforms for ordering food and the growing restaurant industry in the region, are expected to flourish the online food delivery market at a CAGR of 4.1% over the forecast period. Global Online food delivery market report comprises of the following companies as the key players in the online food delivery market: Grab, Delivery Hero, Food Panda, Just Eat, Grub Hub, UberEATS, Deliveroo, and Door Dash. What is the revenue of online food delivery market in 2016-17 and what would be the expected demand over the forecasted period?